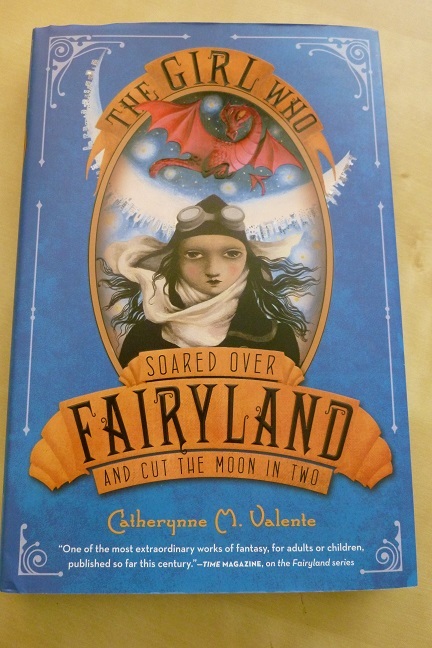 You may have noticed–or guessed–that I was eagerly awaiting the new installment of Catherynne M. Valente’s Fairyland series, The Girl Who Soared Over Fairyland and Cut the Moon in Two. I jumped (flew?) in as soon as the book arrived, and was so very happy to find that it was once again delightful! Fairyland 1 (review here) introduced us to September, a girl from Omaha who flew away to Fairyland, where she met a Wyverary named A-through-L and a Marid (a kind of sea genie) named Saturday, and fought the wicked Marquess. Fairyland 2 (review here) brought September back to Fairyland a year later, to confront her own shadow, who was stealing shadows and magic from Fairyland. Fairyland 3 picks up again a year later. September is beginning to grow up, with new responsibilities, including learning to drive. She’s only fourteen, but I suppose the driving-age rules were lax in rural Nebraska, in the 1940s (or possibly 1910s–I’m not positive which World War September’s father fought in). She still has no hesitation when the opportunity presents itself to return to Fairyland, this time chasing the Blue Wind who has carried off a neighbor’s automobile. September lands in Westerly, the city of the winds, and makes her way to Fairyland’s moon, where she reunites with Ell and Saturday, and sets off to fight a fearsome moon-Yeti. Valente continues the lush and beautiful writing style of the previous two books. There are so many beautiful turns of phrase and twists of thought. We’re still guided along by Valente’s sly narrative voice, who if anything is a little more present here than previously. I was desperately anxious to start reading this book, but once I did, I didn’t feel any need to keep hurrying through. This is not a page-turner, and I mean that in a good way. I normally devour quickly books I enjoy, but this one required savoring. As I read, I was also looking forward to rereading, because I felt like I couldn’t take it all in on one read! These aren’t books driven by the plot and the need to know what comes next–it’s more like a delightful opportunity to linger with September and her friends and enjoy the sights of Fairyland. There may have been a little too much lingering in the first portions of the book. September meets several new characters, and while they’re interesting, I kept waiting to reunite with familiar ones. Ell and Saturday do eventually come in, but I would have liked them sooner–though I can imagine that on a reread, when I know where the book is going, this may bother me much less. The growth from Fairyland 1 to Fairyland 2 continues here, as September continues to grapple with what it means to grow up. In particular, she’s trying to work out what she’s coming to feel for Saturday (and realize that he feels for her), and both September and Saturday have to deal with the question of Fate vs. choice. We get to visit more wonderful landscapes here, including a city (and people) made out of paper, and a photography city all in black and white and two dimensions. This series would be amazing in an animated movie! So I got this far without gushing…let me just wind up by saying this is a lovely, lovely series, and while you shouldn’t start on Fairyland 3, if you haven’t read the first two, go read them! And if you like classic children’s fantasy and brave heroines and fantastical landscapes and poetical writing style, move them to the top of your to-read list!